When a Federal Municipal Bond is acquired; Bond Fund Accounts are established by the Bond Trustee per directions on the Bond. The bond’s money is deposited into the Accounts. In order to access the money the Issuer, in this case the City of Beaumont, submits Requisitions to the Bond Trustee along with Invoices and Receipts showing the work described in the bond has been completed. An audit of Beaumont’s Bond Requisitions to the City’s Bank Statements revealed that the City is either producing forged Requisitions to the Public or has no idea the proper procedures of federal municipal bonds. The City has released $45 Million in Bond Requisitions, but the Bank Statements show $61 Million pulled from Beaumont’s Bonds to reimburse Developer Mitigation Fees. Pardee Homes was paid $49,114,509.64. 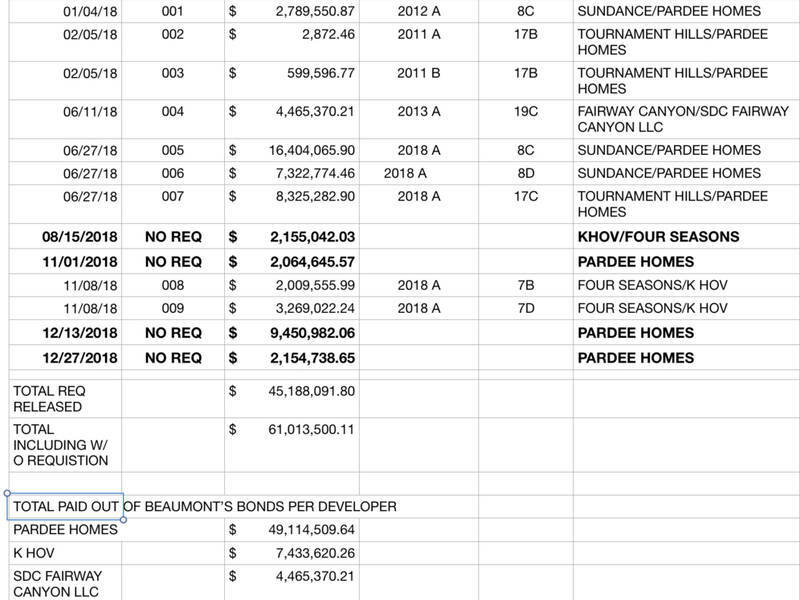 SDC Fairway Canyon LLC was paid $4,465,370.21. In 2016 the S.E.C. froze the money remaining in Beaumont’s Bond Fund Accounts after the City Council approved using the money to pay the salaries of Lawyers and Consultants. There was $12 remaining in the Bond Fund Accounts that should have been used to build Fire Stations. Beaumont’s Bank Statements show that the City has been allowed access to the bond money and has transferred it straight to the Developers. In December, 2017 a Property Owner in Area 14 Prepaid their Mello Roos CFD Taxes. All of the money paid by the property owner should have been transferred to the Bond Trustee to be applied to the Bond’s payments, but the City only transferred $11,867.16 and we all know CFD Taxes are far higher than $12,000. In auditing the City’s Bank Statements I also found expenses that were not listed on the City’s Check Warrant and Approved by Council. And who is ‘Stifel Nicolaus’? 1. December, 2017 Bank Statement page 7, Deposit Date 12/12/17, Amount of $11,867.16, with memo ‘Prepayment Parcel 400190034-3. I want to see documents from the original transaction; copy of the Check or Credit Card Receipt received from the Property Owner. 2. July, 2018 Bank Statement page 15, ACH DEBT for $1,500 with memo ‘Karmic Lowes Com web order. I want the Invoices, Receipts, and the reason why this purchase/payment was not on the Check Warrants. I want the Invoices, Receipts, Communication, and Requisition Documents to justify this payment. 4. November 2018 Bank Statement page 2, Payment date 11/01/2018, Amount of $2,064,645.57 to Pardee Homes. 5. December 2018 Bank Statement page 7, Payment date 12/13/2018, Amount of $9,450,982.06 to Pardee Homes. 6. December 2018 Bank Statement page 13, Payment date 12/27/2018, Amount of $2,154,738.65 to Pardee Homes.